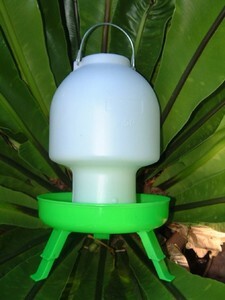 Quality plastic waterer suitable for small or large chickens/hens. This model has 3 extendable legs to adjust the height for as your chickens grow. When the legs are fully extended, less rubbish will be scratched into the water as it is higher off the ground. The neck of the unit is quite high which allows better access for larger hens. 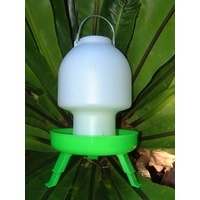 The water holder has a twist-lock for stronger attachment to the base, this makes it easy to carry and shift, using the wire handles attached. It also has a flat top which serves to stand the drinker upright on when filling. Ball drinkers prevent chicks standing in the trough. Drinker, Waterer, Poultry, fowls, bantams, chooks, chickens, chicks, hens.